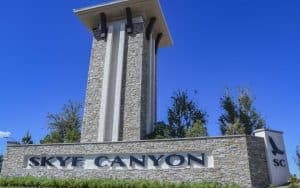 Skye Canyon is the next generation of master planned communities. This great community is in Northwest Las Vegas just North of Providence and adjacent to Centennial Hills master planned community. The Northwest quadrant of Las Vegas continues its rapid expansion with lots of new construction being added monthly by Fortune 500 builders. Skye Canyon homes for sale are highly sought after since they are affordable, family oriented and have lots of new construction being built currently. Skye Canyon homes for sale are located in the 89166 zip code and 89143 zip code.